These ergonomic, handheld bowls keep favorite food duos separate. Great for chips, salsa, dips, and more. We've all done it: eating in front of a movie marathon on the couch, or dinner in bed on a rainy evening. It's OK...you've had a hard week. We understand. I love chips and salsa so this is perfect for me. Easy to hold with one hand and have my chips separate from the salsa. Bought this for my sister for her birthday. She said it was great for snacks like chips and dip. She said her husband keeps taking it to use for his pistachio nuts. I'll have to get one for his birthday! I bought one of these in each color and can't wait to use them with my friends during game night! We use them primarily for snacking while watching TV. Holds a good amount of food, and the design is very practical. My husband bought 2 of them awhile back and I broke one. I was delighted to find them again, and this time bought 3 more to make a total of 4. We love them. 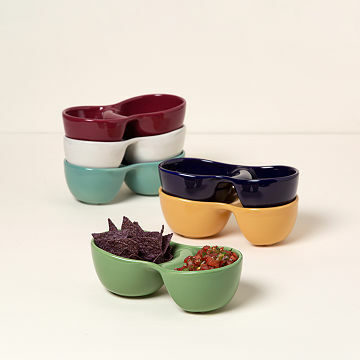 This combination bowl is a great idea, however, the design of the bowl (with hand wrapping around the larger section to hold it), results in the dip or salsa being on the other side of the chips. In other words, you pick up a chip from the front section of the bowl and then dip it behind. It would be better if the smaller section was designed to be held. Then you would pick up a chip and dip it in the section closest to you (from back to front). I am a fan of these bowls because they look great, are functional, and fun. This product takes the cake! So far they are excited to use the product saying that it is handy and looks useful for holding meals on the couch.